ShinoXyoona: My first develop game ever. : Mecca to Medina :. My first develop game ever. : Mecca to Medina :. Before you play this game, please read the instruction on question icon carefully. If not, you will not understand the game. 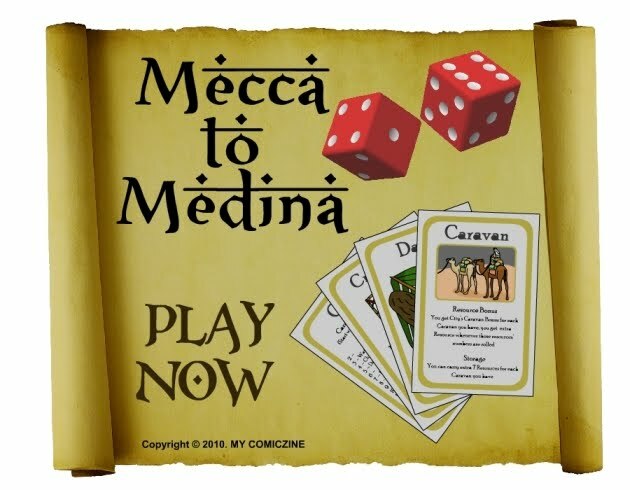 Mecca to Medina online game is a riveting adventure game in which it needs the player to plan the strategic use of resources to complete the routes between cities to gain success. Every roll of the dice creates challenges while playing the game and competition occurred among the players to which it contributed to a more fun and excitement throughout the game. This game is basically the interpretation of history during the Golden Age of Islam where travelers could journey from city to city without border restrictions or pasport requirements. It is a Muslim online game which embedded with Islamic values to be shared with and cherished by all. dah berkurun din oi blog aku tuh. macam best je game ko tuh. nnti free nk try la.